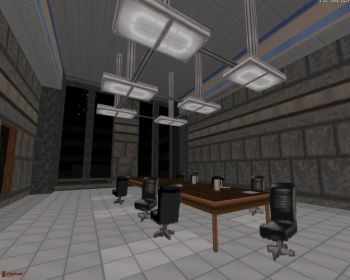 Description: A medium-size city map that revolves around a big library and some kind of a reactor-powered office complex. This is from the author of Crash and Burn, a decent city map that got overlooked here. Into It: The map begins in a somewhat unimpressive port segment featuring a boat in a largely empty outdoor sector. After a dive through some underwater tunnels, you make it to the library area. This is probably the most impressive library in a Duke3D map so far, especially considering it's no simple feat to make a library segment interesting. 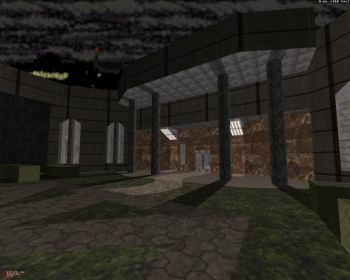 You'll get dozens of bookshelves after dozens of bookshelves but the map has a pleasantly spacious architecture, giving it a unique look and making it fun to run through. The same rules apply to the following office complex with large hallways and seemingly tons of routes to choose from. However, this also results in a layout that can be very confusing at times, especially when combined with a rather unimaginative switch puzzle that has you going back and forth. Moreover, I was forced into cheating when the map required me to use the Shrinker on a mirror that had been blown to bits many minutes earlier. Ammo is scarce and monsters carefully planted around the map, which I actually found refreshingly challenging, but those of you who tend to overspend ammo might run into trouble. Even so, the map's wide open spaces should help you maneuver until you're better positioned. The map is packed with a terrible custom track that I had to turn off right away. Conclusion: Midnight Arrival is architecturally quite impressive even if lacking in details from time to time. It offers challenging and thus rewarding combat but the overall experience is brought down a bit by its confusing layout and naive, unrewarding central puzzle. Clocking in at nearly 30 minutes, the map approaches the high-end of medium-size maps.